Kent on Sunday was axed by publisher Archant this month after 15 years of publication. At the time of the closure announcement, Archant said there would be a “a number” of redundancies but said that it would seek to find new roles for those affected. However KoS editor Chris Britcher, left, has now confirmed that he has left the business while the three reporters who worked on the paper have all found new jobs with a rival publisher. As reported on HTFP earlier this week, the closure of KoS and its Ashford office that the Kentish Times, which was also produced there, has now moved to the company’s East London base in Barking, 56 miles away by road. However it has now emerged that none of the three reporters who worked on the Times and KoS opted to make the move to Barking and have instead taken jobs with erstwhile rival the KM Group. 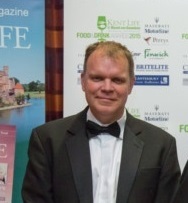 Chris told HTFP: “It is with huge regret I left Archant as editor of both the Kent on Sunday and Kentish Times series last Friday after being made redundant. My last act was seeing off the final edition of KoS. “All three reporters who worked on the four titles we produced in Ashford were offered alternatively employment in the Barking office but subsequently have been offered roles with the Kent Messenger Group. Chris spent more than 12 years with Archant including five as editor of KoS, combining the role with that editor of the Times series for the past two and a half years. So why the KOS group?